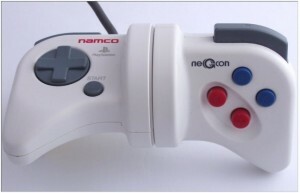 This is the neGcon from Namco, originally made for Ride Racer on the PSX. I still remember the day when I first saw this controller. Schnee bought it (for a shitload of money) and I didn´t liked it in the beginning. But later I cherished its precise control in racing games and still today it´s small and innovative device. Much better than the analog sticks used for the xbox360 or the PS3. 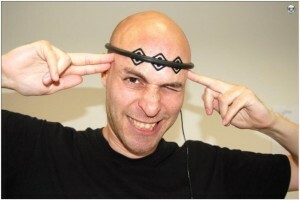 This one is a brain controlled device. I saw something similar years ago at a hospital specialized in epilepsy therapy. The patients controlled a little spaceship in a left-to-right scrolling game and tried to avoid a collision with objects – only with their “thoughts”. It should help them to recognize outbreaks of the epilepsy early and minimize the seizure. Anyway – in this picture it shows a game controller. Until now it´s not very popular but I´m sure that this concept of controlling will become more important in the future.